Darren C. Demaree is one of my favorite poets, and I was delighted to receive an advanced copy of his new collection, Not for Art Nor Prayer, scheduled to be published in October by 8th House Publishing. As usual, after reading Darren’s poetry, I’m at a loss for words that would justify the beauty of the work. What do you say about words that leave you in a different place then you were in before you read them, that open you up inside. Language and form that leave you with a sigh and a smile, that make you feel connected, and make you wish you could write that damn good. One reason I enjoy Darren’s poetry so much is because he pours pieces of his own self into his words. As you read the poems, you feel like you get to know the poet. And this new collection accomplishes this in a big way, from his Adorations, to Wednesday Mornings, to Emily, it’s more than words on paper, it’s the poet on paper. Not for Art Nor Prayer is a must for your poetry collection, but it’s not one of those books that will sit there on your shelf looking pretty. It will stay close by, always at reach, and the words will stay close to your heart. If you’d like a taste of Darren’s work, be sure and check out his poems in our September/October 2015 issue. 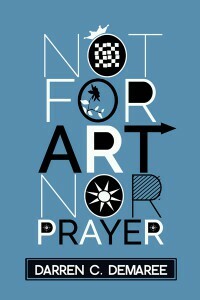 You can find Darren on his website darrencdemaree.com and watch for the release of Not for Art Nor Prayer at 8th House Publishing.